Time for Five Minute Friday, friends. 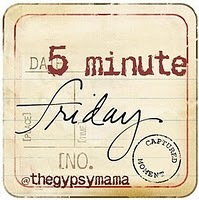 Please click over to the Gypsy Mama for rules and to join in. They sit silently in the car. Itching to find something to say, knowing that if they open their mouths all that will come out is tears. Their hands intertwined stubbornly, not wanting to let go. The car keeps moving them closer to their destination. Fingers squeeze tighter with every mile. They park and he opens her door. Their eyes meet and they exchange wan smiles. She clings to him in an unexpected hug. He melts into her. Eventually they pull apart. Time continues ticking. They unload the car and walk tentatively towards the open, automatic door. They discuss schedules and plans. They get checked in and move towards the gate. He stops and meets her eyes. They are welled up with tears that spill over as she catches his glance. His eyes sting as he takes her into his arms. They cry together through hug-muffled I love yous and prayers for safety. Then he meets the eyes of his children. Red with tears they all tackle him in one giant hug. He wonders how much they will have grown before he sees them again. He kisses each one and gives them words of advice and reassurance as he embraces them. He takes his family in his arms one more time. With strenuous effort he releases them, kisses his wife, and walks heavily toward security. She watches him until she can't see him anymore- catching one last glimpse of him in his combat uniform. She waves as her heart crumbles and walks away with her kids. Gathering up her well of strength, patience and love to get her through until they meet again. For my friends who have to do this today, and for all the members of the military and their families who make this sacrifice more times than anyone should have to. Thank you for your service to our country. My love and prayers go out to you all.